Mit dem Savegame Manager (oder ähnlichem Tool) das Savegame auf SD-Karte kopieren, dann das Savegame (wiimj2d.sav) mit Tanooki öffnen und bearbeiten. Nicht vergessen nach dem man Sachen verändert hat auf Update zu klicken und dann auf File ---> Save zu klicken. Für mehr Infos die Readme lesen. management fixes. Launch with parameter /nw to disable Stage-To-Save warning. Added region converter feature. Fixed small bugs. focus of the application. Added support for players 2-4. Fifth BETA release. Adds new features to and fixes minor bugs in Tanooki Toolkit. Fourth BETA release. 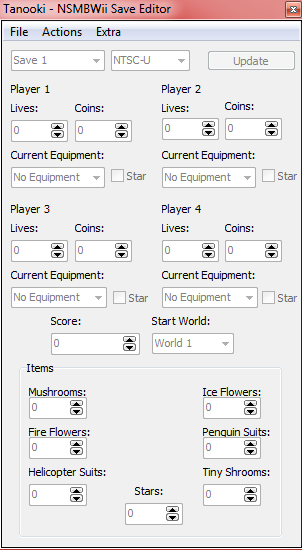 Introduces the Tanooki Toolkit save editor. Minor bug fixes. Third BETA release. Introduces graphics, smart-scrolling, and item modifiers. Second BETA release. Fixes bugs and introduces new GUI layout.